Image courtesy of NS Newsflash of Flickr. In the fall of 1986, I was one of a group of young upstarts who thought we would take on one of the oldest student newspapers in the country. I was a writer and editor on the staff of The Badger Herald, a weekly at the University of Wisconsin-Madison. Founded in the campus turmoil of the 1960s, the Herald long saw itself as an alternative to The Daily Cardinal, Madison’s storied campus voice. In 1986, we got a head of steam to take the Cardinal on in a daily battle for news and advertising revenue, making us the only campus in the country with two daily student newspapers. When the Herald announced this spring that it was returning to weekly in print and embracing a digital-first strategy, it took me back to those heady days. I had picked the Herald over the Cardinal largely because one of the editors at the orientation meeting was super hot. But the competitor in me fired up when we dove into the daily battle. The Herald had given me experience, excitement and, eventually, a husband. Yet in looking at its new strategic direction, the paper gave me something else: the feeling that we’re fast approaching a tipping point on print in college media. When it comes to advertising, campus papers have had a wonderful thing to sell — a captive audience of young spenders who like clothes, activity and especially a good party. 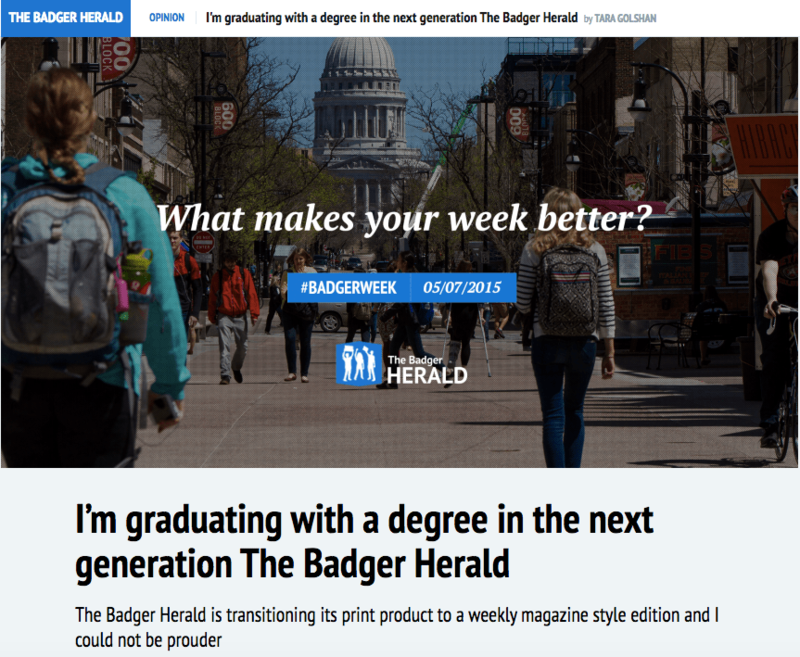 Bars, restaurants, retail shops and vacation companies all wanted to advertise in my beloved daily Badger Herald. But today, those same entities have countless other ways to reach this coveted demographic. 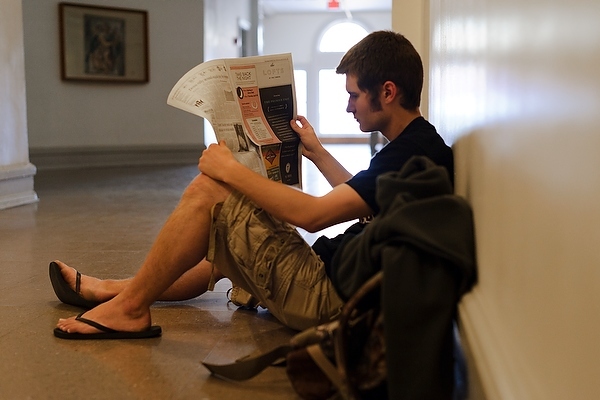 Freed by digital devices and new, targeted means to deliver information, the college audience is no longer captive. The Kollege Klub bar doesn’t need the Herald and Cardinal to run its specials when it can start its own social campaign to reach drinkers directly. Three other factors have dinged the advertising bottom line for our papers, as well, according to Herman Baumann, an alum who leads the Cardinal’s board. As universities expand physically, they push local businesses further away. In Madison today, businesses in the immediate campus area are only about 40 percent of their density in 1970. In addition, national chains have moved in and choked out local businesses. Campus ad staffs have a much tougher time selling to the Abercrombies of the world than to a local retailer. Finally, universities themselves have gotten into marketing competition with campus media, inking massive contracts with national and big local advertisers for athletics and other events. Yet campus media knew the vast majority of their ad revenue was still coming from print, not any of the digital efforts they were trying to gin up. 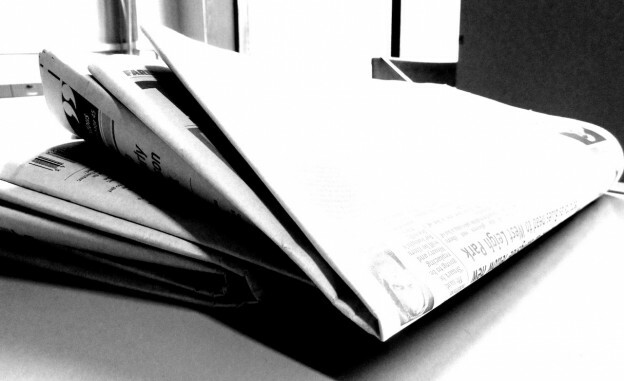 Trying to save on the costs of putting out a daily paper while still trying to capture revenue from print, the Herald moved to twice weekly print in 2013. Coming out in hard copy four days a week, the Cardinal is now the only remaining daily student newspaper in Wisconsin. From essentially the moment the Herald went to twice a week, outgoing editor Tara Golshan wanted it to go weekly. She thought of the Herald as an innovative entity, but reporters weren’t doing even the digital basics — getting a photo to illustrate a story online or hyperlinking within text. She wanted to meet an audience of her own generation on their own terms and in their own preferred spaces. She challenged her colleagues to question why they made print primary when even they didn’t consume their own news in that medium. The staff’s hope is to now use digital platforms for breaking news and constant updates while focusing the weekly print on long-form storytelling and deeper dives into campus issues. “We should really capitalize on these things (and) how people are using their news, especially our own generation,” Golshan says. For college media expert Dan Reimold, the Herald’s gambit makes sense. Top-tier papers have steadily moved away from daily print as costs increased, revenues declined and audience habits changed. “This is the biggest reinvention of the student newspaper since it arrived in its current form in the late 1800s,” he says. Yet this migration is certainly not without risk. Reimold says any student news organization that goes halfway on a transition will not succeed. A digital-first strategy has to be an all-in proposition. Reimold sees genuine risk in these outlets losing their voice on campus and getting lost among the many apps, outlets, and services crowding students’ digital streams. “The biggest fear across the board is the idea of losing that presence on campus. It’s important because the college campus is one of the last key places besides train stations in which there are a bunch of people milling about outside and walking around and gathering en masse,” he says. At the Herald, staff hope to maintain primacy on campus by rebranding efforts that will include new attention to events, apps and other revenue generators. They’ve already played with new story forms, shunning the traditional game story in sports, for instance, in favor of a nugget-based approach covering best quote, top play and the like. Beyond the excitement, though, Golshan says her colleagues do recognize the risk. Yet that risk may well be one of the most instructive elements for students learning to work in media organizations. 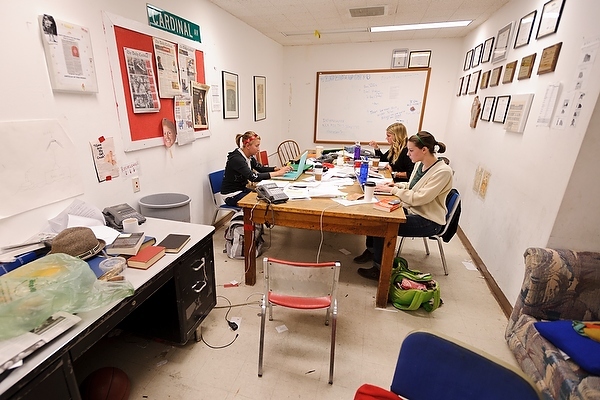 Nadia White, an associate professor at the University of Montana and adviser to its Kaimin newspaper, sees tremendous benefit as her students learn to take their publication from four days in black-and-white broadsheet to weekly in a color tabloid. She says business reasons were part of the motivation for the change, but the educational value is also a key factor. With feet on the ground and heads in analytics, the students have to learn how to attract and retain audiences and sell them to advertisers. That’s been a challenge recently for the Kaimin. Screenshot of Golshan’s column announcing the Herald’s new approach to covering news at UW-Madison. The fleeting attention and brand browsing of today’s student audience vexes most campus media outlets. Many were struck when a University of North Carolina student editor lamented her peers’ lack of loyalty to the student newspaper she bled to produce. Reimold sees this apathy problem replicated on virtually every campus he encounters. As the Herald tackles its new reality of weekly print and constant digital, the Cardinal is plotting its own future. Baumann says the team plans to stay daily through December, and then assess the market and analyze business model options. Reimold hopes the fire my friends and I started in 1986 will continue to blaze brightly in Madison. Join the conversation on campus media transitions in our live #EdShift Twitter chat at 1 ET Tuesday, June 23, featuring the sources in this piece and other advisers and staff. Dan Reimold also is leading a DigitalEd training module on how these outlets can reinvent themselves. Join him Wednesday, July 15, at 1 ET by registering in advance.